Join us at Milton’s Cuisine & Cocktails for our 2019 Farmyard Chowdown Festival on Sunday April 28th in our backyard and garden! 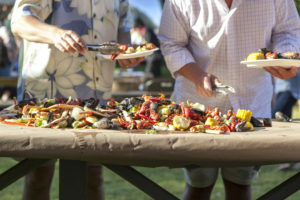 We’re taking our annual Low Country Boil up a notch and you don’t want to miss it! Chef Derek will be dishing out a feast of oysters, mussels, pickle fried chicken, BBQ, a low country seafood boil with crawfish, crab legs, shrimp, and more. Enjoy a live band and round up your friends or fam to play lawn games including corn hole and life size jenga. Capture the moment in our photo booth station and have a caricature artist portrait made to take home as a keepsake. Other activations are soon to be announced! Buy tickets online here, $40 per person and $20 for kids 12 and under. Alcohol will be sold separately. We look forward to celebrating with you!